A few days ago [Andrew] contacted us to offer his help for the design of the mooltipass project case. While introducing himself, he casually mentioned his OLED watch that you can see above. 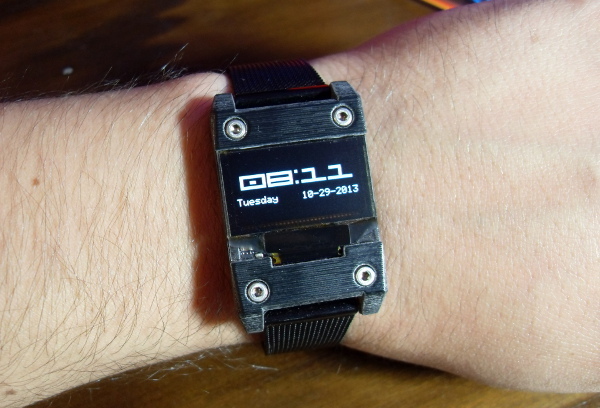 The watch is based on the low-power MSP430F microcontroller from Texas Instruments. It can consume as little as 1.5uA while maintaining a real-time clock and monitoring interrupts. It also uses ferroelectric RAM, which doesn’t need any power to retain its memory contents. That means there’s no need to set the time again if you remove the CR2016 battery that powers the watch. [Andrew] chose an 0.96″ OLED display that only consumes up to 7mA. He also included an accelerometer that allows him to interact with the watch through its single and double tap detecting feature. He modeled his PCB using EagleCAD and the whole assembly using Sketchup. Most of the components were soldered in his reflow (toaster) oven. The final result is a mere 8.8mm thick and looks very professional in our opinion. I guess that depends on how long it takes you to replace the battery, and how much deviation from NST time you’re willing to tolerate. FRAM is good for non-volatile storage, like calibration settings and such. But RTCs require power. This! This! This is what I want on my wrist! Something programmable, practical, and not too big. Ideally with a little joystick or something to put Tetris or card games on. Did you know there’s no wrist-based games aimed at adults AT ALL!? Well probably you did, but I don’t like to wear my Tetris watch out too much, cos it’ll get damaged. If you need a project for next year, do a watch! A cheap, clever, versatile one. There’s currently nothing available that’s all three, even though there should be. I want bluetooth on it. That way I could talk to my phone and PC. What could it do? Set the time and sync appointments. It could even act as a caller id. You can already get those, though not cheap or user-programmable. Still yet to have one play Freecell though. Not too bothered about “accurate” as long as it’s close enough, I don’t need to time atoms. Standard digital watch accuracy is fine. For me, “accurate watch” is one I don’t have to reset the seconds/minutes except when I have to change the Hour setting for Daylight Savings On/Off. If it keeps within a half minute during that time frame, it is accurate enough for me. The Sony Smart Watch (first gen touch version) has it’s source code up and available for hacking. Wow – that’s a great looking watch. It’s very futuristic, industrial but sleek at the same time. It looks like something straight out of the Aliens series. Is it waterproof? No. Impact resistant? No. Stylish? Not really. Obnoxiously large? Well of course. Who even wears watches nowadays unless it is a status symbol? My watch is a mobile phone. Cheap Chinese wrist-phone. When you get used to it’s pretty bad interface, it’s pretty good. Plays MP3 and has a camera, which is overkill but that’s Chinese gadgetry for you, they like to add features. You can get “MP7” players now. But I’d prefer this one. Mobile phone clocks are as accurate as their network time source. I’d say you probably do, and you pick them very, very carefully. You’re certainly missing the point. I think it’s stylish, but then what’s your style? As for impact and water resistance, don’t use it underwater and don’t hit it. Oh my goodness! if only the pooor fool asked you how to spend his time and money! Well those who can, hack, those who cant hate. Looks awesome, I want it. Please get it manufactured and sell a lot of them. I love the industrial design. The first thing I thought of was 5th element, and then I started reading and saw “mooltipass”. It almost made me laugh out loud. Anybodies else though, “I WANT THAT!”? The design is just awesome. This guy and that other watch from a few months ago (with the same screen?) should team up. That would make an awesome timepiece. HAD commenters have become so lazy these days! If I’m going to wear a wristwatch for time, it’s going to be because I can “set it and forget it” — that means no worrying about a battery! So I quicky gathered some numbers. The low power MSP430 — 1.5 uA. The accelero in the low power mode i believe would support a “double tap” function — 6 uA. Powering the OLED for 1% of the day (~15 minutes) — 70uA equivalent (1% of 7mA). I can’t really read his schematics (low res jpg), so I’ve got to assume that chip on the mid-left is some sort of lower power charge pump. I’ve used them before, they’re monolithic apart from decoupling caps — pretty nifty. They are typically around 90% efficient. That gives us 86uA equivalent current draw (again, quick numbers). On a CR2016 cell (90mAh) that’s 1046 hours, or 43 days. Not too bad! However, these are some near-best-case numbers, don’t include everything (quiescent of OLED, full-on draw of the uC, internal losses of the coin cell, etc). I’d like to see him replace that cell with a rechargeable version, and add some sort of little recharge circuit… for mother earth! the text explains the ICs. there is a 2v under voltage protection IC and a 3v LDO. he says they’re to support LiPo cells. from what I can see there is a jumper link in the form of SMD pads that when shorted bypass this for use with a coin cell. so technically your rough numbers would be 53 days. over a week extra.